Recently, Chris prepared us a nice Walleye dinner. She was making a sauce that required a dry white wine. If you are not sure what a “dry” white wine is, this may help: During fermentation, the process of converting the grapes sugar into alcohol. The yeast must convert all of the sugar to alcohol. There has to be zero percent sugar left in the wine. If the yeast stops fermenting and there remains sugar that is called “Stuck fermentation”. There are many possible reasons for this such as the temperature of the wine was to high during fermentation, the alcohol content was to high, or not enough nutrients. So back to looking for a dry white. For the most part all Sauvignon Blancs are considered to be a dry white. Additional whites to consider are Pinot Grigio, Spanish Albariños and Austrian Grüner Veltliners. Some wines often fall between dry and off-dry: many New World Chardonnays, Rieslings, Viogniers and Pinot Gris, for example. And some whites are always sweet: Sauternes and “late-harvest” bottling’s of grapes such as Riesling and Chenin Blanc are examples. The first place I looked was in the wine chiller that is in our pantry off of our kitchen. Inside the cooler I had a few Rose’s, Chardonnay, my 1963 Taylors Fladgate Port; as well as a bottle of Sauvignon Blanc. This Sauvignon Blanc must have been left by one of Chris’ friends during a girls night, so I went with it. I pulled the cork and poured a cup for Chris’ sauce. Since the bottle was open, I decided that I should pour myself a glass and rate the wine. Since the wine was going to be part of the sauce, I was also hoping it was decent enough to enjoy a glass for dinner. Pale color depth with a green hue. The aroma was moderate and fruity, while I noted pears and green apple. 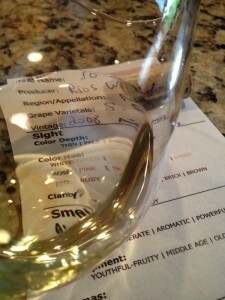 The Sauvignon Blanc was dry and light-bodied and I thought it was slightly tart. I did not notice any tannins and it was flavorful. As I mentioned it was slightly tart, my lips would pucker up with my initial sips. I could taste citrus flavors and the finish was long. How much: Not quite sure. Looking on-line its a $20 bottle. It’s a little high. 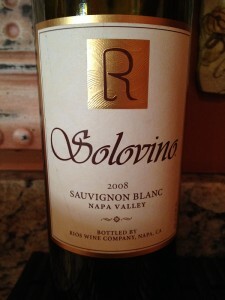 I rated the 2008 Solvino Sauvignon Blanc two glasses.